While Jewish communities worldwide express concern about the flooding in Texas, for the New Orleans Jewish community, it’s personal. Seeing footage of flooded streets and people being rescued from rooftops by boat and helicopter brings back memories of 2005, when the levees broke and flooded New Orleans after Hurricane Katrina, scattering the entire community for months. The Jewish Federation of Greater New Orleans has already launched a Hurricane Harvey Relief Fund with the Jewish Federations of North America. In a message to the community this morning, the Federation said “In 2005, Houston was there for us. Let's be there for them now.” To start the effort, the Federation and anonymous donors allocated $50,000 to the fund. After Katrina, the New Orleans Federation was housed at the Houston Jewish Federation’s offices, until it was possible to return to New Orleans. The Union for Reform Judaism’s Greene Family Camp is being set up as a place of refuge on a space-available basis for members of the camp community — camper, congregant or friend. “GFC can provide families with housing, food, air conditioning, internet and electricity for a limited time.” Those looking to shelter there need to make advance arrangements to ensure space. Loewy is collecting donations to his Rabbi’s Discretionary Fund, to be forwarded to rabbis in Houston “to assist their members, just as I was able to during our time of need.” Loewy is the sole remaining senior congregational rabbi in the New Orleans area who was there during Katrina. Rabbi Matthew Reimer of Temple Sinai in New Orleans said the congregation is planning to send a truck in the coming weeks once specific needs have been identified, just as they did for Birmingham and Baton Rouge in recent years. Cantor Joel Colman is coordinating with Wal-Mart and United Way. Rabbi Gabe Greenberg at Beth Israel in Metairie is also collecting contributions through the discretionary fund for use in Houston. The congregation is also assembling a list of individuals and families who are able to house those needing shelter. Beth Israel was the only Jewish congregation in New Orleans that had to completely rebuild after Katrina. In urging support for Chabad of Houston’s relief fund, Chabad of Louisiana’s Rabbi Mendel Rivkin said “Who understands what they are going through better than us, the people of New Orleans,” and urged the community to pay it forward for the assistance Houston gave so many from New Orleans 12 years ago. Sharon Pollin, head of school at Jewish Community Day School in Metairie, said the school is opening its doors to Jewish Day School students from Houston for as long as necessary. "Our community welcomes the opportunity to 'pay it forward,' as so many New Orleans Jewish Day School families were welcomed and treated like family by Jewish day schools in the communities to which they evacuated." The national Jewish disaster responders, NECHAMA: Jewish Response to Disaster, is fundraising in anticipation of being deployed to the region once they have been cleared by local authorities to enter the area. Last year, after widespread flooding in Baton Rouge, they were on the ground for a couple of months, working to muck and gut flooded homes so they could be repaired. Many in the New Orleans Jewish community have posted messages opening their homes to those fleeing the flooding. On Aug. 29, Will Samuels of Pizza Nola will be collecting gift cards to be given directly to Houston area restaurant and hospitality workers, through Houston restaurant groups. “Please help us commemorate the anniversary of Hurricane Katrina by helping those in need,” he said. Those out of town can send donations via PayPal. Chabad of Baton Rouge is organizing supplies and a group of LSU students and community volunteers to go to Houston on Sept. 3, conditions permitting. Those interested can register here. Beth Shalom in Baton Rouge is also collecting gift cards and contributions. 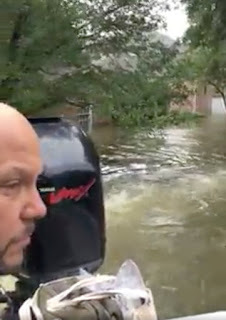 Houston’s Jewish Herald-Voice reported that Jewish community leaders participated in a conference call on the afternoon of Aug. 27 to assess the situation. Jewish Family Service reported 150 neighborhood blocks where members of the Jewish community live that were flooded. At that point, staffers of JFS and the Jewish Community Center had not been able to access the facilities to assess the expected flooding. Several synagogues were also reportedly flooded. Houston’s JFS urges community members needing assistance to call their main line, following instructions on their preparedness page. Many community members had to be evacuated by boat. Rabbi Scott Hausman-Weiss, his wife and younger son had to break into the house next door, which has three floors, after their home flooded. They were retrieved by a boat from California. Hausman-Weiss, rabbi of Sh’ma Koleinu, had previously been assistant rabbi at Birmingham’s Temple Emanu-El. Emanu-El in Birmingham is collecting funds that will be sent to Hausman-Weiss' congregation to assist those in need. Also in Birmingham, volunteers in the Jewish community have arranged for a truck to leave for Houston on Thursday or Friday, with items to be distributed by JFS in Houston. Plans are to include air mattresses that are lightly used from Maccabi Games, new twin sheet sets, diapers, wet wipes, trash bags, deodorant, toothpaste, toothbrushes, sanitary products, new socks, new lightweight blankets and cell phone chargers. Items can be dropped off at the Levite Jewish Community Center or the downstairs entrance to Temple Beth-El by 10 a.m. on Aug. 31. Other Jewish communities affected by the storm include Corpus Christi, near where Harvey made landfall, and Galveston.